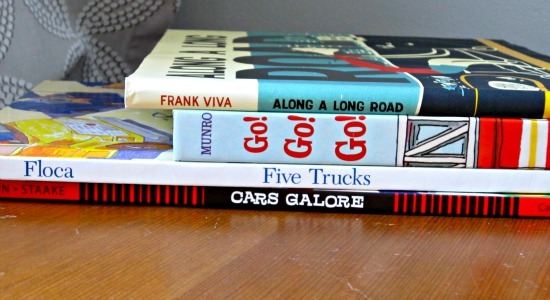 One of my favorite poetry activities that kids can easily do at home is spine poetry! It’s a fun way to get kids to “write” poems even if they are initially resistant to the idea. My 8 year old does have fun composing haiku but I haven’t been able to find a way to get him interested in writing other kinds of verse. However, he loved the idea of spine poetry since all he had to do was stack books. I had a great time, too. Here are some of the poems we “wrote”. They are not very sophisticated, but you have to start somewhere! Although this is a great project to do at home during National Poetry Month (April! 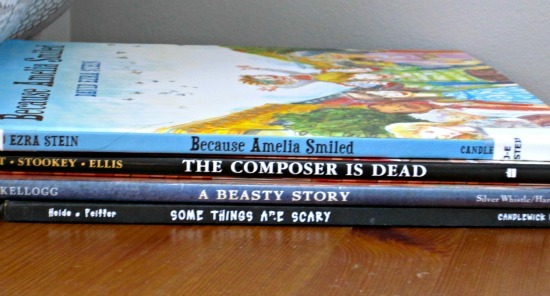 ), any time of the year is a good time for spine poems. 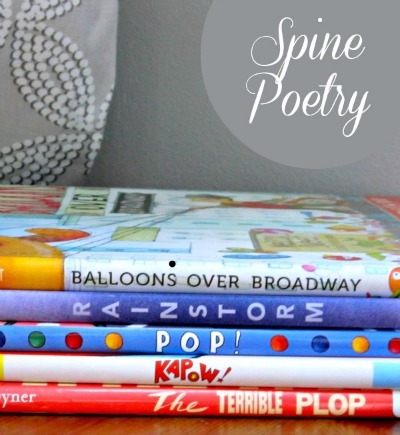 I don’t know where exactly the idea of spine poetry originated, but I discovered it while reading school librarian Travis Jonker’s blog, 100 Scope Notes. You can see others’ creations at his post earlier this month. 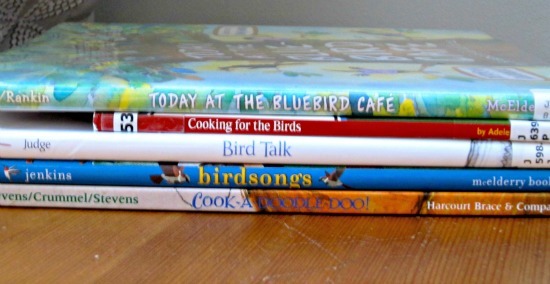 What spine poetry will your kids create? Come back here and leave your spine poem in the comments, or better yet, I invite you to post your photo to our facebook page! Wow, I’ve never heard of this. What a wonderful idea! I’m just starting to do more writing with my little ones. I think my six-year-old would really love this. My daughter would love this! She says she’s a poet…..
Fun post. I will have to make some. I have never ever heard of this! I am totally obsessed! So cool! Thanks for sharing!!! What an awesome idea! My 5yo is just starting to read, so this will be a perfect activity before too long. Pinning now! Thanks, Kelly. We’ve been having so much fun with it. I love this! This is such a fun activity. And leads to lots of giggles. Great idea! Thanks for sharing it. I’ll post some pics soon on your FB page!